Chiropractic or Osteopath Treatment: What’s The Difference? Chiropractor or Osteopath Treatment: What’s the Difference? 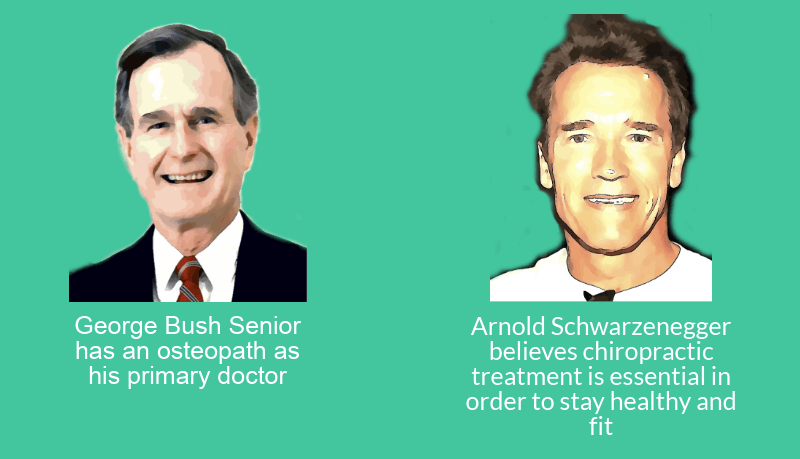 What’s The Difference Between An Osteopath And A Chiropractor, Anyway? Chiropractor or osteopath: what’s the difference? It is not uncommon for clients to wonder about the differences between osteopathy, chiropractic, and (to a lesser extent) physiotherapy: after all, each are well established practices in western medicine, and there are similarities that make such confusion understandable. In fact, for some professionals the debate remains unsettled. There is the popular joke that “the only difference between osteopathy and chiropractic is the spelling”; and some practitioners have given up entirely, admitting they simply cannot differentiate between the two (although this is rare). But there are key differences. In order for us to truly appreciate these differences, we first need to look at the similarities and beginnings of both. Osteopathy as a method was refined in 1874 by Andrew Taylor Still, the son of a physician. As a child Still was a persistent headache sufferer, and this may have contributed toward his interest in health and wellbeing. He studied medicine and, during the American Civil War, served as a hospital student. Chiropractic appeared a little over a decade later, in possibly 1895, by Daniel David Palmer. Palmer had a strong interest in the origins of disease and practiced “magnetic healing”. Eventually he identified the fundamental causes of malignant health as “subluxation”, or: the misalignment of vertebrae causing “nerve interference”. In its initial instance, chiropractic was strikingly similar to osteopathy; it is even believed that David Palmer trained briefly under Andrew Still. And both are regarded today as CAMs (Complementary and alternative medicines). 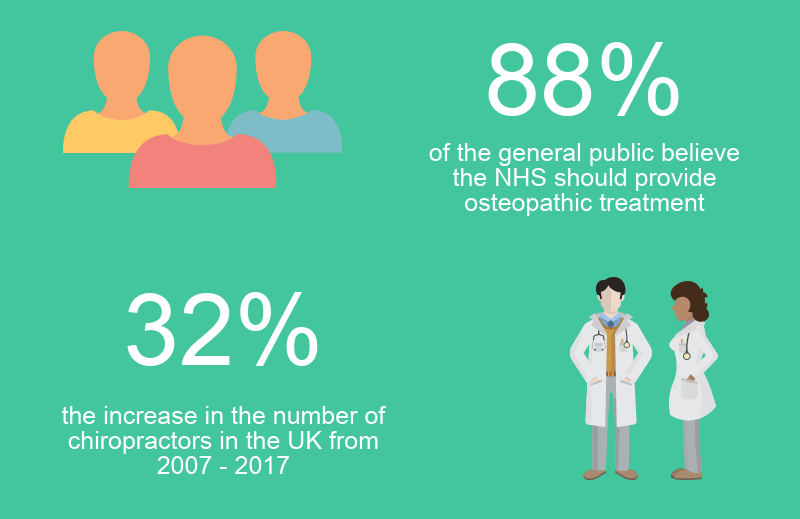 This is because, generally, both osteopathic and chiropractor treatment “falls outside of mainstream healthcare” and are practiced mainly to complement and assist recovery. Unlike other CAMs, both osteopathy and chiropractic are recommended by NICE (the National Institute for Health and Care Excellence) as manual therapies for pains such as lower back pain, and both are regulated as conventional medicines: with laws that ensure practitioners are properly qualified and adhere to the right standards and codes of practice. Which should you choose, the chiropractor or osteopath? Chiropractors — still heavily influenced by David Palmers quest to trace the source of disease to misalignment of vertebrae – focus primarily on the spine and, to a greater extent, the skeleton. For chiropractors the main ambition is to achieve “proper alignment of the skeleton”. Osteopaths consider the body as a whole. The skeleton, and the spine in particular, is still of great importance to the osteopath, but osteopathy is a means to achieve bodily structural integrity via muscle manipulation. In simple English, osteopaths believe that, by incorporating elements of the massage for pain relief, they can speed up the recovery process. There is also a more nuanced form of osteopathy treatment available: cranial osteopathy. This also underlies a philosophical divergence from the chiropractic, as osteopaths share founder Andrew Still’s suffering from and desire to overcome headaches. Both practices have similar endgames, only the technique is different. A potential client should discuss any health problems they have with a GP, and only then should both a chiropractor and osteopath be consulted for an educated opinion on the course of treatment. Osteopathy sessions typically last longer than the chiropractic. They involve elements of “visceral” massage (meaning, the massage is concentrated to the main core of the body, especially the abdomen) to release and relax the muscles, followed by a stretching of stiff joints. This, unique to osteopathy, is often known as soft tissue therapy. Chiropractic treatment is more spine-orientated and, according to some accounts, quite “aggressive” (as opposed to soft tissue therapy), although many welcome this approach. Osteopaths think more cause-and-effect. To the osteopath, a headache could be the result of an aching foot. For example, an aching foot could put additional strain on the hips, which in turn could impact the functionality of the surrounding muscle, and so on. A word for this, if not ill-defined, is the global approach of osteopathy, referring to the practice’s incorporation of all parts of the body. Chiropractic treatment is well known for its “adjustments” to the skeleton. Because of the central focus on the skeleton and the spine, a chiropractor may request an X-ray, and blood tests, as part of the induction. Osteopathy has a derivative process, cranial osteopathy, which necessitates “gentle manipulation” of the head; incorporating traditional osteopathy but with a greater focus on the “structures” within the skull. It has been linked with improved sleeping patterns. Does osteopathic and chiropractic treatment work for back pain? Osteopathy and chiropractic are both proven and recognised treatments for pain relief, being recommended by the NICE institute (see above) – but back pain and lower back pain in particular are two of the most common reasons for clients seeking complementary healthcare. This is not surprising. In 2014 alone, a shocking 10 million working days were lost to back pain in the UK, costing the economy over £1 billion. The majority of those being affected were in the over-50s category. It has been described as – and lower back pain especially – as “the leading cause of disability” costing even more than cancer and diabetes treatment combined. Conclusion: Is it time to look for a pain clinic, or an osteopath in London? We hope that, after reading this guide, the differences between osteopathic and chiropractic treatment are somewhat clearer. It should be remembered, though, that this is intended as a guide only. It must be re-emphasised and stressed: if you have any problems please consult your GP first, and then an osteopath and a chiropractor, so you can make the most educated choice as possible. At Bodytonic Clinic we offer both osteopathy and cranial osteopathy sessions. Contact us for a consultation, and for more information on osteopathy and cranial osteopathy. You can see our Ultimate Guide to Osteopathy, Physiotherapy and Chiropractic here!